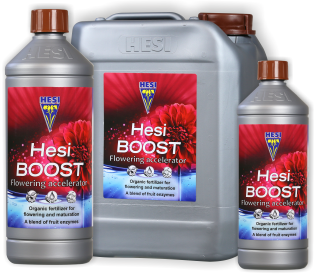 HESI BOOST - complete organic fertiliser for intensifying flowering. Complete organic fertiliser for intensifying flowering. A mixture of fruit enzymes, plant sugars and fruit extracts. HESI BOOST is a very effective flowering stimulator. It ensures an early and larger flowering. HESI BOOST is suitable for all media. This specially designed combination of nutrients increases the leaf density, reduces leaf distance and boosts the plant's energy for a strong and stout growth. This powerful organic nutrient solution increases the number of flower buds of your orchids and strawberries. as leaf nutrient 1 ml per 1 litre nutrient solution. Use on orchids a maximum of once every 2-4 weeks. Fruit extracts, fruit enzymes such as galactol, plant sugar melitose, alginic acid, and much more. Minerals: such as magnesium, calcium, potassium, phosphorus and other trace elements such as iron, etc., of natural origin. Storage: at 5°C - 22°C, closed and in a dark place out of reach of children. Packaging sizes: 0.5 litre, 1 litre, 2.5 litre, 5 litre and 10 litre. This bloom stimulator is extremely effective and should not be used more intensively than indicated here. In handing to intensive one feels that the plumes are sticky. Also apply after total loss of flowers by environmental factors and new purchases!